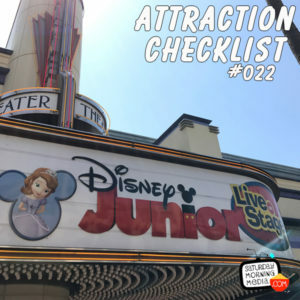 http://www.attractionchecklist.com – Let’s head to Disney California Adventure and check out the, now closed, Disney Junior – Live on Stage! Attraction Audio Recorded on April 4, 2017. This episode we’ve got something for the younger fans as we check out the recently shuttered Disney Junior – Live on Stage! at Disney California Adventure. This guide map describes the show by saying, ’Sing and Dance with your favorite Disney Junior Characters!’ There are no age or height requirements for this show and each production lasts roughly 23 minutes. Before we visit Mickey and his friends, here are five fast facts about Disney Junior – Live on Stage! 1. Disney Junior – Live on Stage! opened at Disney California Adventure on April 11, 2003 under the name Playhouse Disney Live. The show replaced the ABC Soap Opera Bistro, a restaurant that featured sets from famous ABC Soap Operas. 2. The original version of the show that opened in 2003 was the same as the Playhouse Disney Live show that was running at Disney’s Hollywood Studios in Florida. It featured characters from Bear In The Big Blue House, Rolie Polie Olie, Stanley and The Book of Pooh. 3. Over the years, the show has featured characters from other Playhouse Disney/Disney Junior shows including Jojo’s Circus, Handy Manny and Little Einsteins. The current iteration of the show that we’ll hear today features Mickey Mouse Clubhouse, Sofia the First, Doc McStuffins and Jake and the Never Land Pirates. 4. A team of six puppeteers are cast for each show and they manipulate over twenty different puppets of the various characters who interact with the show’s human host and the audience. 5. All the characters in the show are voiced by their original voice actors including Corey Burton doing his incredible version of Hans Conried’s Captain Hook. Now it’s time to visit the Mickey Mouse Clubhouse at Disney Junior – Live on Stage! Stay tuned afterwards as I give my thoughts on the show as you’ll be experiencing it with me as I watch for the very first time. Also, this is a binaural recording, so if you have headphones put them on now as we enjoy Disney California Adventure’s Disney Junior – Live on Stage!